Unique and evocative home movie of the ill fated liner passing onlookers as she departs on her sea trials. 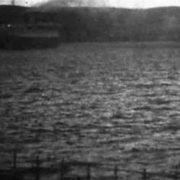 The ill-fated liner passes onlookers off Gourock, Scotland. This film is by the same photographer as the Queen Mary sea trials film but taken a year later. The Orient liner Strathallan approaches the camera. A distinctive ladder and platform is visible to the right… what can it be? Can you identify the location? Shipyard workers or crew line the prow. Her hull rides high in the water. The ship’s name is clearly visible. Her clean lines and elegant white hull are evident in this close-up. As the immense hull passes by a crowd of people wave from a jetty. A small boat passes alongside. The camera pans past the crowd to reveal another onlooker and a strange tank-like object is visible sitting atop a frame in the water. The distinctive stern passes. The decks a clutter of lifeboats, ventilators, derricks and wires. A painting rig still attached to the side. She steams away… four years later she lies at the bottom, torpedoed.